This Mama isn’t afraid of a bargain. In fact, I thrive on them. I geekily adore thrifting and finding unique treasures to make our home, home. My Mom (your Mum Mum) is the reason I am who I am, she loves to thrift too. I love repurposing and thinking creatively. Your Daddy does too- he made me a bed out of reclaimed barn wood and it’s one of my favorite treasures. I love yard saling and Goodwill. Oh, how I love Goodwill. Some might think it’s grubby, but that’s because they haven’t truly embraced it for all it’s shiny goodness. I usually look for household items & antique sheets (they are the best!). I very rarely find clothes because that takes another caliber of patience that I don’t possess. Lately, however, I’ve kept my eyes peeled for baby things. My last Goodwill shop was very successful! I haven’t been out of the house in 3 days because I have been so sick with a cold and I’m going stir crazy. I need to get out and about and have a date with myself. Coffee shop & Goodwill? Sounds like the perfect pick-me-up! Well babe, off I go to try to score some baskets for Christmas presents at you guessed it, Goodwill. I’ll see what other loot I can find too. I can’t remember the last time I’ve had it but this is by far the strongest I have craved anything yet. Your Dad is on the night shift so I’m trying to contemplate whether or not to get out of my pjs, fix my hair and run to the grocery at 10pm. Excuse me, but I’m NOT glowing? The pregnancy glow is a lie. There is nothing glowing about me. and other unmentionable, heinous acts. Baby, I love you. I truly do with all my soul. But this pregnancy thing so far, rips. And if one more person uses the term PREGGO or PREGGERS to refer to my current state, I will slap them with a sandwich. We are finally 12 weeks and the chance of anything traumatic has dramatically gone down. I sigh a tiny bit of relief. You are now the size of a PEACH! 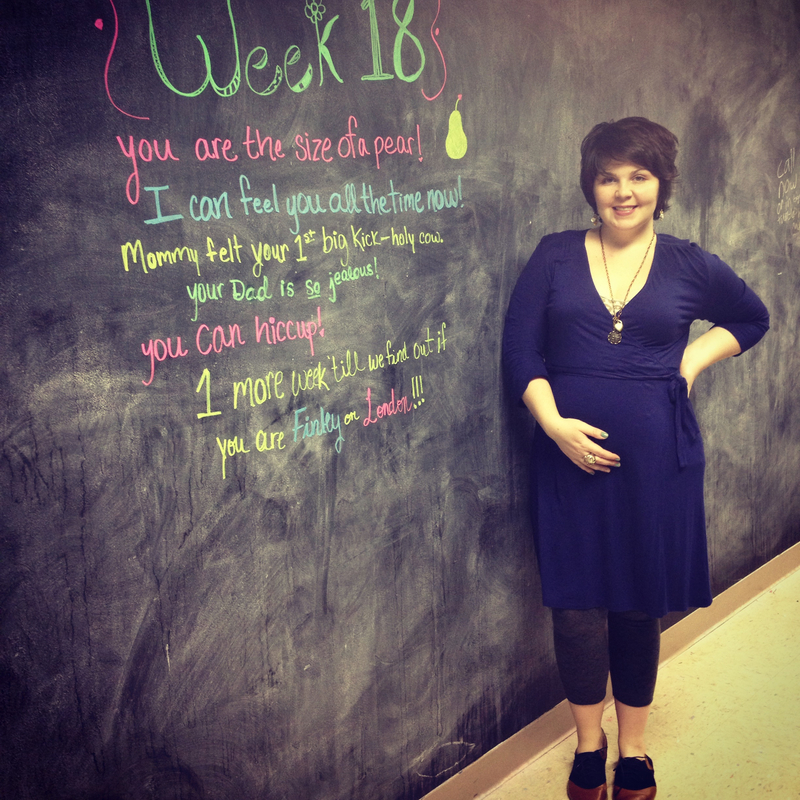 That’s pretty big and its hard to wrap my head around that I have a peach sized baby inside of me! I’m not showing yet although my favorite jeans are a little harder to zip up- I’ve been sticking to dresses and yoga pants as of late. This week you are grasping, sucking and hiccuping and your vocal chords are forming. You are really becoming quite the little person. Thankfully, my nausea has settled down the past couple of days but I’m not too hopeful that it is completely gone. Earlier this week, it was absolutely horrible and had me in tears at work. I finally called the midwives and begged for medication. They happily prescribed Zofran and it has been working like a dream! I wish I had done it sooner. My newest symptom is heart burn. At first, I was unsure what was going on because I have never had heart burn in my entire life! It feels as if something is on fire and stuck in my chest. I thought it was because I hadn’t swallowed my pre-natal vitamin well but after it lingered all day I knew it had to be heart burn. I will take it over nausea and throwing up any day! Daddy and I have been wondering if you will be a boy or a girl a lot these days. If you are a girl, we will name you London June. If you are a boy, we have said August Monroe. Today though, I am not sure if I am 100% on August. I love the name Avery or Archer for a boy too but your Dad is in love with August and is not budging. We shall see! Maybe you will make it easier for us and be a girl so we don’t have to decide on a boy’s name. Christmas is soon approaching and I have to buy a few more presents. 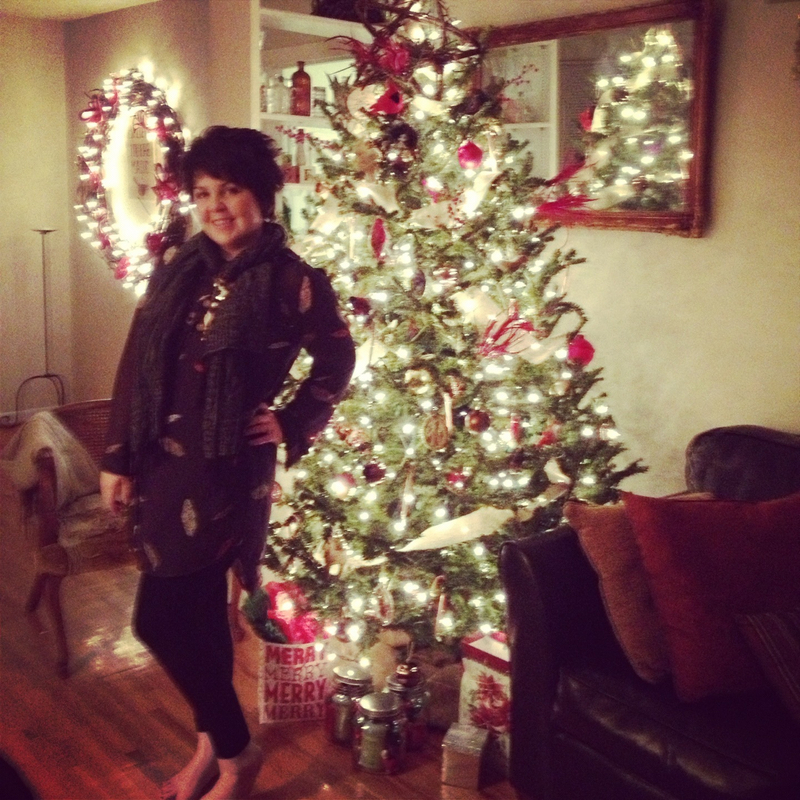 Next year, I will be buying you Christmas presents! You will be six or almost 7 months old by then. That’s unfathomable to think about right now! 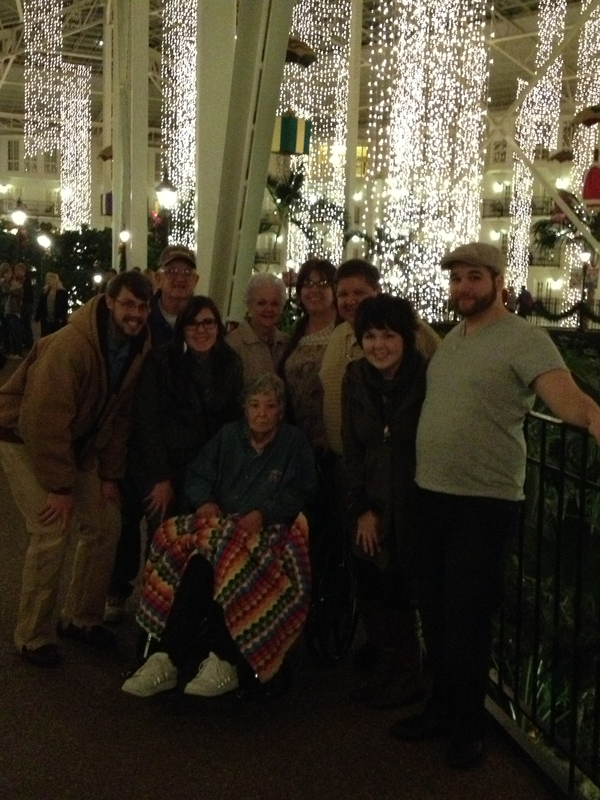 Thursday evening, we went to Opryland Hotel to see the Christmas lights with Granny Boo, Paps, Mum Mum, Pop Pop, Aunt Whitney and Walker. I think it was really good for Granny Boo to see the lights and she particularly enjoyed the life sized nativity scene. 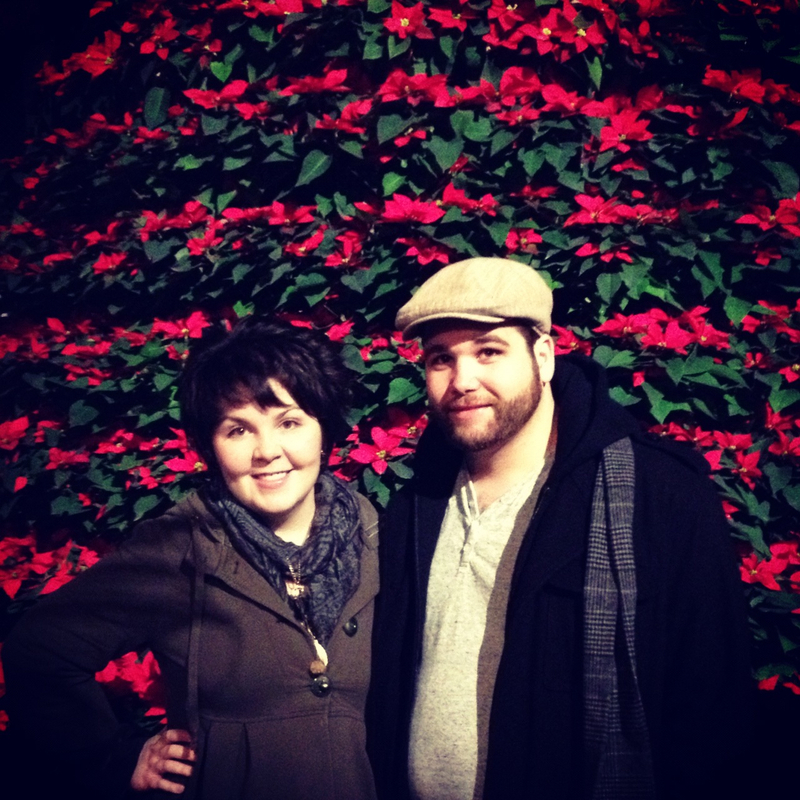 Your Dad & I in front of a ridiculously sized poinsettia tree.